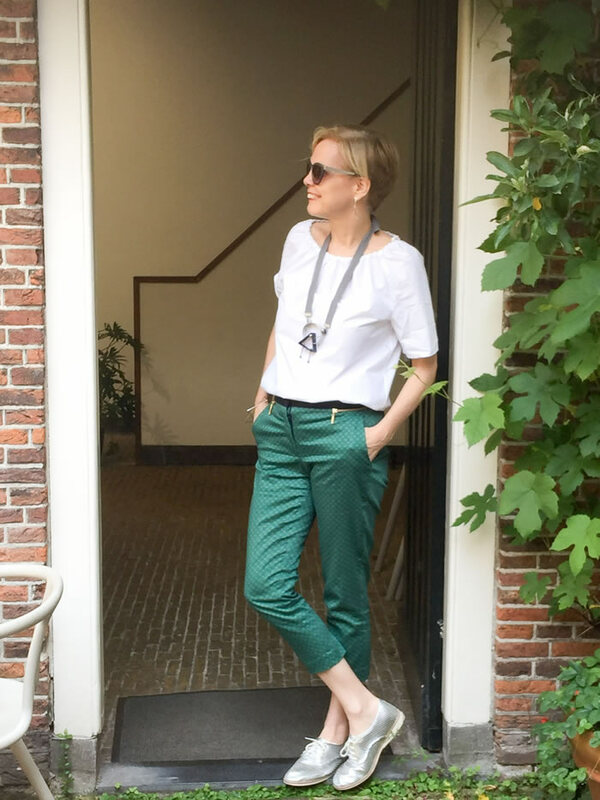 Get ready for summer with the 40+Style Club Summer Capsule wardrobe! 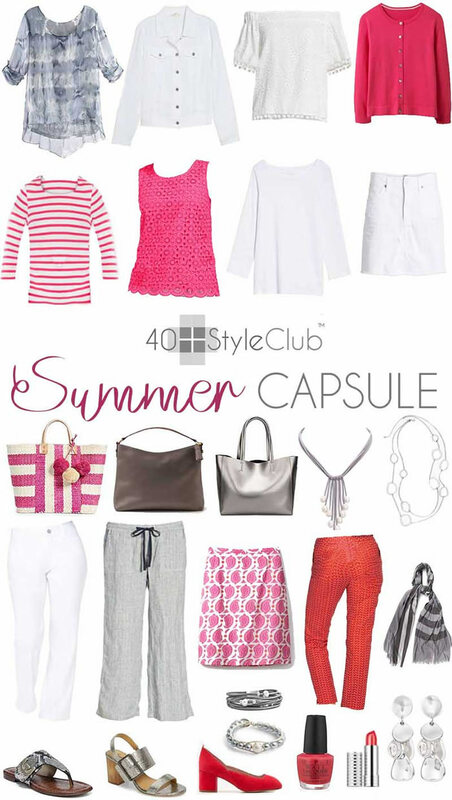 40+ Style » Finding your style » Get ready for summer with the 40+Style Club Summer Capsule wardrobe! Summer is here which means it’s time for relaxed summer dressing! You want to look stylish, but also stay cool. You want to look put-together but also get out of the door quickly so you can enjoy the sun, go to a barbecue or a summer wedding and enjoy time with friends. Our new summer seasonal capsule full of timeless, wearable pieces will be perfect for that! Style club members are already busy planning and sharing their summer wardrobes based on this capsule. What exactly is a style club seasonal capsule? Each season, we create a unique capsule for you. This will make it easy to create your summer wardrobe and will give you lots of ideas for your own outfits. Each capsule consists of 13-15 clothing pieces and various accessories. This summer capsule has 13 clothing pieces + accessories that you can mix & match to create 76 unique outfits. That will surely have your summer covered! It also makes for a great capsule to take on your summer trip. Take a look at this short video for a preview of the capsule. How to use the capsule? The seasonal capsules can be either literally copied by buying the selected clothes or you can shop from your own wardrobe. Each capsule comes with a detailed shopping list which includes the selected pieces and several alternatives. Many of our members also shop their own wardrobe for the capsule. We also encourage each member to create their own interpretation of the capsule. The style club is all about INDIVIDUAL STYLE which is why the capsules are used more like a guidance rather than a strict ‘what to buy’ list. Since we put a lot of emphasis on style training and discovering your individual style, each member interprets the capsule to suit their own body type and personality. That’s why, when we do the challenge and share 10 unique outfits from the challenge, you will see all kinds of interpretations of the same looks by all the members. Take outfit 2 for example. Here is my interpretation of this look. Similar, yet different but completely suited to my own unique style. Since I’m currently in The Netherlands, I didn’t have a colorful skirt with me or my pink top, so I swapped the skirt for a gray dotted skirt. I swapped the top for silk top which allows me to do a bit of print mixing. The shoes are new and I wear then with almost anything. You can find them in several colors here. These pants are your fun in the sun look. They add a dash of color and personality to you summer outfits. Keeping the palette neutral but adding shape and pattern in this off the shoulder white croquet top. Straw comes into its own in summer. Big enough for running errands or a day at the beach. Colour makes this a fun edition for your french Riviera styling. Mid Heel pink suede pumps. It is the colour that makes these a statement element of your outfit. I love the red printed pants but don’t have these. I do have some green printed pants which is what I used for my look. Again, both of these are older items, so I’m just shopping my wardrobe! The shoes are new (and I wear them everywhere) and you can find them in several colors here. Of course this look can be be perfectly combined with the white jacket too. Why is the capsule wardrobe so useful and so much fun? There are a number of reasons why we do these capsules and challenges and why our members find them so useful and so much fun. They give you a clear idea of trends and current pieces for the season. The capsules help you plan your seasonal wardrobe. They help you learn how to mix & match clothes so you can do more with fewer clothes. Through the accompanying challenge, you will get lots of further ideas for outfits. Since each woman does something completely different with the suggested outfit, you can learn from the creativity of others and get many more ideas for your own looks. They help you discover your own wardrobe as many women discover lots of new and exciting outfits in their own wardrobe. They help you save lots of money as you learn how to do much more with fewer items. What makes the style club and the style courses so unique is that it’s all about discovering your own unique style. We will give you guidance and lots of feedback, but in the end, it’s up to you to create your own style. Only you know what clothes make you feel fantastic and which colors will make you shine. Through all the training, challenges, capsules and professional feedback, we give you a lot of support in that journey, so you too can feel amazing every single day! If you like to get access to the full capsule and take part in the fun capsule challenge join us in the style club! Learn how to look amazing every single day with fewer items and always have something fabulous to wear. Very useful. I am getting better at combining and packing with capsules. I have even travelled to London with just hand luggage. For three days/two nights and a big award event. That was a first. Usually I need a big suitcase. Beautiful summer combination, can’t wait to wear them. Love your ideas now to buckle down and start making a capsule wardrobe. Previous post: How to wear stripes like a pro!